“To be a pastry chef isn’t just a job – it’s a calling and a way of life,” says Smith. “What I love most about patisserie is the science involved. In order to be a great pastry chef, you have to understand each ingredient – fat, flour, salt, eggs – and exactly what they do.” Smith maintains that the right technical training is the springboard from which to explore a world of interesting flavours and textures – and technical training she’s most certainly had. Smith always knew she wanted to work with food. After studying at the Warwick’s Chef School, she embarked on a European culinary adventure, taking a position as a trainee at the Chesterfield Hotel in Mayfair, London. “I started out washing dishes, watching master chefs and trying desperately to learn anything I could from them, although they weren’t always forthcoming with sharing their skills,” recalls Smith. “One Irish chef, in particular, really made me sweat to gain any insights – I pretty much had to watch first, and then deduce the theory myself afterwards. It was nothing if not a baptism of fire.” Once she was confident enough to take up a position as chef in Chesterfield, Smith knew she wanted to settle in South Africa at a top-10 restaurant. She returned to work at the 12 Apostles Hotel in Cape Town where she gained valuable insights into premium South African gastronomy. 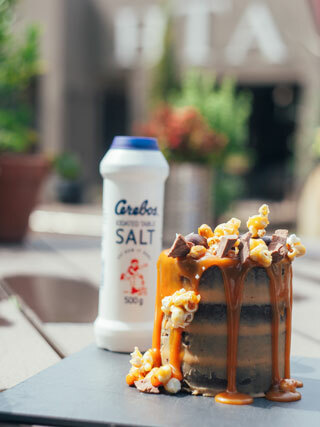 But it was Smith’s time at Rust en Vrede that moulded her exceptional baking talent. “I was petrified when I started at Rust en Vrede – I felt completely out of my depth – but working with Chef David Higgs was a dream of mine, so I threw myself into it with everything I had,” says Smith. “Chef Higgs became a valuable mentor and teacher of mine, always pushing me to do better and push the boundaries of what I thought was possible.” In fact, Higgs’s impact on Smith was so fundamental, she travelled with him to Johannesburg when he took up the position of Head Chef at the Radisson and, subsequently, the Saxon. “I never envisioned my career leading me to Johannesburg,” says Smith. “But, in retrospect, I’d never have learnt what I have if I’d stayed put.” After fine-tuning her patisserie skills in the kitchens of the Saxon, Smith decided to join HTA. “Teaching has always been a calling for me,” she explains. “Working with my students and helping them become better pastry chefs allows me to share the knowledge I’ve gained along my journey.” Smith’s goal is to expand the patisserie school at HTA – all while competing in international culinary competitions. 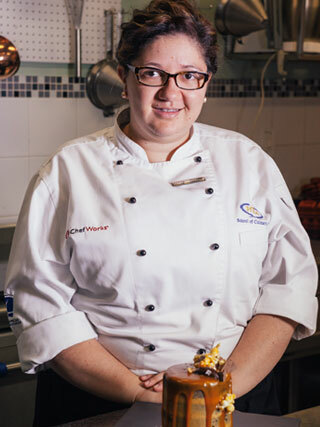 In the past few years, she’s taken part in the Junior World Cup for Pastry Chefs in Italy, as well as the Global Pastry Chef Challenge in Namibia. In 2016, she’ll represent the South African National Culinary team in Germany. Whip the cream to soft peaks and fold in. Put the sugar and the nuts in a pan, over a low heat, and slowly caramelize. Pour onto silicon paper to cool. Heat the cream and chocolate in a double boiler until the chocolate is completely melted. 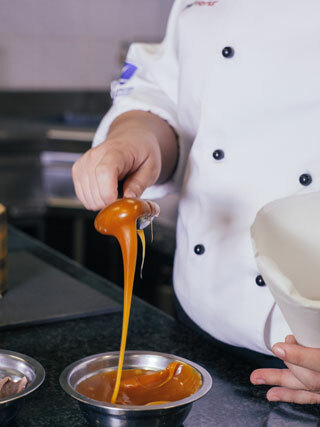 Slowly heat the sugar over a low heat until a caramel forms – do not mix otherwise the sugar will crystalise. Heat the cream and add to the sugar and butter mixture. Put the butter, glucose and sugar in a pot and heat until it turns into a light caramel. 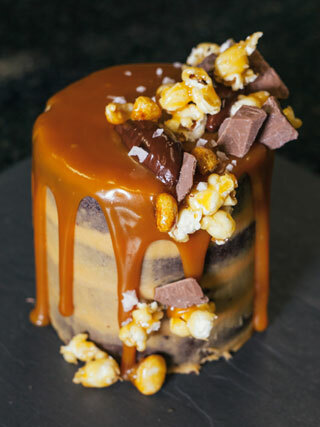 Pour the popcorn into the caramel and keep stirring until the popcorn is completely coated. Pour out on a silicon mat and allow to cool. 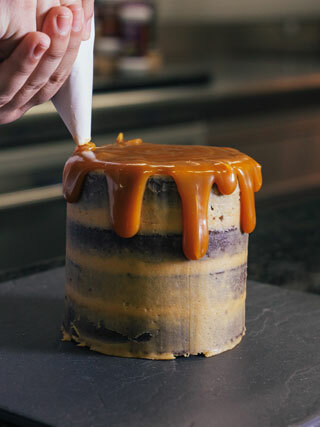 Slice the cake into two halves horizontally. 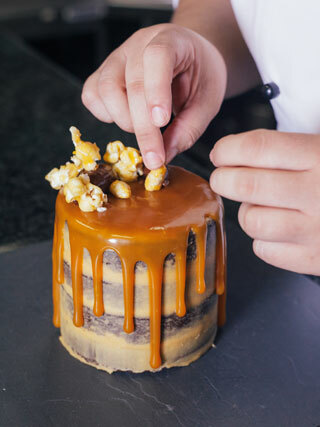 Spread one layer of the cake with the peanut butter buttercream and chocolate crème. 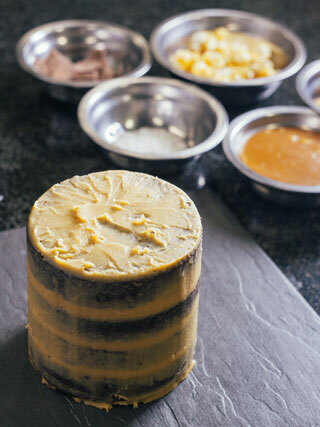 Ice the outside of the cake with the remaining peanut butter buttercream. 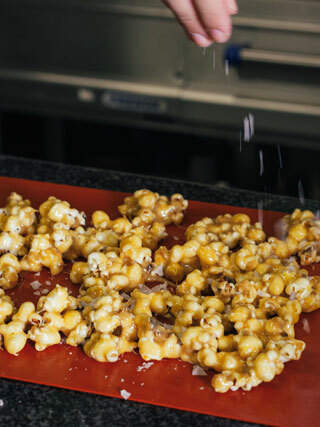 Decorate with the popcorn, peanuts and some chocolate shavings.